Your inner child stays with you throughout your life. It is that small, tender part of you that feels things strongly, that maybe wishes things had been different when you were growing up - even if you had the most loving, caring parents. It is the part of you that wants more attention, more affection, that feels needy and would just like MORE, even if it can't define exactly what more it wants. We have been doing a lot of Inner Child work as part of the Self Love Immersion ( There is still time to join so head over and join the fun) and it is amazing the stuff that comes up. I have just been working on the next three emails to go out and look forward to hearing what is going on with the ladies in the group. One of the exercises this week was to find a picture of ourselves as a baby or toddler and post it to our desktop, as a cellphone wallpaper or somewhere that we would see it daily. 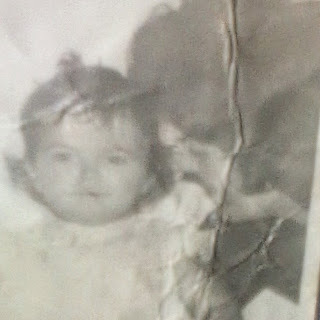 (yes, that's me and my Mum) What I found this week was how much my inner child still felt wounded, unloved and in need of some appreciation, some celebration. Now, that is not to say that my parents didn't do the best that they possibly could to love me. I was the fourth of five children and I know now as a Mother of three just how hard it is to meet the expectations of all your kids and the more kids you have ( in my case, step children got added to the mix) the harder it gets and inevitably someone feels that they are not getting their fair share of attention. When we were growing up we didn't have birthday parties ( well, I remember having one when I turned five) , what Mum did do though was make us chocolate eclairs for a birthday treat. As my week progressed I could feel myself longing for one, for the acknowledgment that I was special and someone cared for me ( I know, such a first world problem). I launched my book earlier this year and I still didn't feel like I had celebrated or acknowledged that enough. I am also fully aware that it is my job to fill me up, to acknowledge myself and my achievements, to celebrate me. Now most store bought ones are a sorry affair - fake cream, melted chocolate instead of chocolate icing and dry, crusty choux pastry. This one was nothing like that - I could tell just by looking at it. So I did what any rational child would do - I bought it and ate it. More than that I savored it and talked to my Inner Child telling her how proud of her I am , how much I love her and what a great job she is doing. And I felt myself soften and bask in that praise and feel just a little more whole. So how have you fed your Inner Child recently? Come over and join the Self Love Immersion group and share . Sign up for the emails here and don't worry this weekends email gives you a round up of all the past emails so you can catch up.